Here is a local Singaporean photo competition ideal for all the families who read this blog. 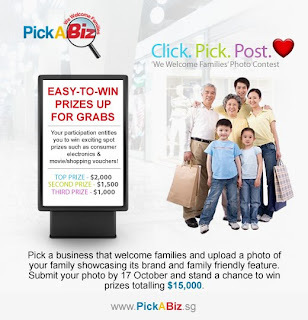 Organised by the Businesses for Families Council (BFC) and supported by the Ministry of Community Development, Youth and Sports (MCYS), all you have to do is upload a photo of you favourite family-orientated business along with a description, and stand to win some great prizes. Tell the story of how the business actively demonstrates the "We welcome families" mindset so that other families can try out your recommendation. Think about where your family is most comfortable. It could be your favourite restaurant with its great kids' menu, a shop with great discounts, or service centre with easy access for strollers and toddlers. It could be the friendly welcome you get that makes the business special or the great service that makes it really appealing for families. The top prize is $2,000 and there are great weekly prizes, including vouchers for Resorts World Sentosa and NTUC Fairprice. The competition is open until 17th October, so get uploading! Hi! This weekend is the last weekend the Pick A Biz activation teams will be roaming and picking up entries. So if you're heading down to Century Square or Tampines 1 Sat & Sun 1-5pm look out for them and get your entry in then and there for a chance to turn your shopping trip into some great prizes!